We have had our Floatron for approximately 4 years. We live in SW France and have used it in a mediaeval ‘pond’ which is stone lined and which is filled by water draining off the hill above. It measures 2.5 metres x 4 metres and is roughly 1.5 metres deep, obviously less in the heat of the summer. 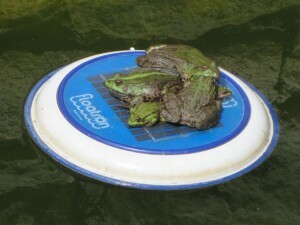 The frogs use the floatron as a sun-bathing platform!